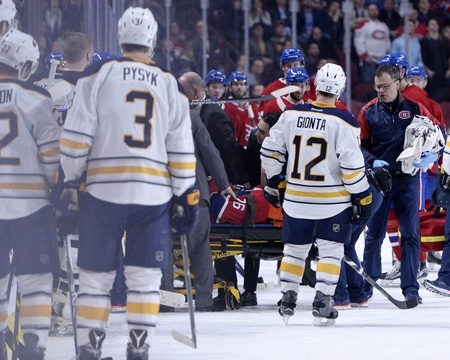 It was a scary scene on Thursday night at the Bell Centre as defenceman P.K. Subban was stretchered off the ice following a collision with teammate Alexei Emelin. The blueliner was down on the ice for several minutes, but was able to move his arms and legs. Max Pacioretty reported that he was speaking as he left the ice. Now, after testing at Montreal General Hospital on Thursday night, Subban was released and is facing a non-serious neck injury. As bad as the situation looked on the ice, the Habs and Subban have very good news on this Friday morning. There is no word on a timetable for a return to the ice as of yet, but thankfully he’s going to be okay. Pacioretty went through a similar situation nearly five years ago to the day. Boston Bruins defenceman Zdeno Chara slammed the Canadiens forward into a stanchion at the Bell Centre. Pacioretty suffered a severe concussion and a fracture of the C4 vertebrae on that play and the incident set off a whirlwind of controversy, with even the Montreal Police Service getting involved. Luckily, there is no such controversy this time and the freak accident that took down Subban was a complete fluke. Earlier in the day, Subban was awarded the Jean Beliveau Trophy by the club for his community involvement. He made a $10 million commitment over the next seven years to the Montreal Children’s Hospital and has been a pillar in the community since his arrival on the Habs.